Since pioneering the fiberglass door industry in 1983, Therma-Tru has redefined the industry with high style, high-performance products. That tradition of innovation and superior engineering in design continues today. Learn how we continue to set the standard in door innovation and technology and about the many advantages that come with Therma-Tru entry and patio door systems. With The Classic-Craft Collection, you get more. Every detail — from wider glass to heavier construction — creates a more premium entryway. Featuring the American Style Collection, inspired by the simple design and handcrafted details of Craftsman and Prairie home styling, Therma-Tru Classic Craft Doors add unmatched curb appeal to your home! 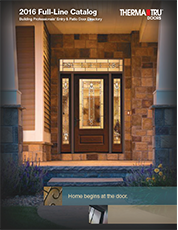 From curb appeal to convenience, Fiber-Classic entry doors are made to keep up with your lifestyle. Available with the rich aesthetics of mahogany or the natural warmth of oak, these doors offer a traditional look of wood, with all the benefits of fiberglass.